Physical training has a well-established role in the primary and secondary prevention of coronary artery disease. Moderate exercise has been shown to be beneficial in chronic stable heart failure. Competitive sports, however, is contraindicated in most forms of hypertrophic cardiomyopathy (HCM), in myocarditis, in pericarditis, and in right ventricular cardiomyopathy/dysplasia. In most European countries, the recommendations of medical societies or public bodies state that these diseases have to be ruled out by prescreening before an individual can take up competitive sports. But the intensity and quality of this health check vary considerably from country to country, from the type of sports activity, and from the individuals who want to participate in sports. Prescreening on an individual basis should also be considered for leisure sports, particularly in people who decide to start training in middle age after years of physical inactivity to regain physical fitness. In leisure sports the initiative for a medical check-up lies primarily in the hands of the “healthy” individual. 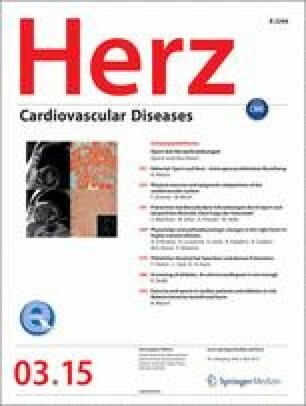 If she or he plans to participate in extreme forms of endurance sports with excessive training periods such as a marathon or ultramarathon and competitive cycling or rowing, they should be aware that high-intensity endurance sports can lead to structural alterations of the heart muscle even in healthy individuals. Physical exercise in patients with heart disease should be accompanied by regular medical check-ups. Most rehabilitation programs in Europe perform physical activity and training schedules according to current guidelines. Little is known about athletes who are physically handicapped and participate in competitive sports or the Paralympics, and even less is known about individuals with intellectual disabilities (ID) who participate in local, regional, international competitions or the Special Olympics or just in leisure sport activities. Körperliches Training und Sport sind bewährte Bestandteile der Primärprävention der koronaren Herzerkrankung und der Sekundärprävention nach Herzinfarkt. Patienten mit stabiler chronischer Herzinsuffizienz profitieren gleichfalls bezüglich Lebensqualität und Leistungsfähigkeit von dosierter körperlicher Belastung. Dagegen ist Wettkampfsport bei den meisten Formen einer hypertrophischen Kardiomyopathie (HCM), bei Myokarditis und Perikarditis und bei rechtsventrikulärer Kardiomyopathie kontraindiziert. So werden in zahlreichen Ländern Europas Athleten mit diesen Erkrankungen vor Beginn einer angestrebten sportlichen Laufbahn vom Wettkampfsport ausgeschlossen, wenn sie an einer Voruntersuchung teilnehmen und sich diese Krankheiten nachweisen lassen. Auch Freizeitsportler sollten zu ihrer eigenen Sicherheit diese Erkrankungen ausschließen, bevor sie beginnen, Sport zu treiben. Menschen, die sich zu einem körperlichen Training nach Jahren körperlicher Inaktivität im mittleren Lebensalter entschließen, sollten vorher einen Sportarzt oder Kardiologen konsultieren, bevor sie ihr Fitnesstraining aufnehmen. Die Forderung nach medizinischer Begleitung auch von Freizeitsportlern gilt besonders für Ausdauersportarten mit sehr hohem Trainings- und Leistungsanspruch wie Marathonlauf, Rad- und Rudersport. Bei diesen Extremsportarten kann es auch bei ursprünglich gesunden Teilnehmern zu strukturellen Veränderungen im Herzmuskel kommen, die das ursprüngliche Ziel der körperlichen Fitness vital gefährden können. Unsere Kenntnis vom Nutzen und Risiko sportlicher Aktivität von Sportlern mit physischen Handicaps, die an Wettkampfsportarten bei paraolympischen Spielen teilnehmen oder von Athleten mit geistiger Behinderung bei Special Olympics ist äußerst begrenzt und bedarf vermehrter Aufmerksamkeit und Dokumentation bezüglich vorbestehender kardiovaskulärer Erkrankungen. Conflict of interest. B. Maisch states that there are no conflicts of interest. The accompanying manuscript does not include studies on humans or animals.